Kuussuup Sermia is an outlet glacier in southern Greenland, 61.3 N 45.3 W. It actually a distributary glacier, with three different termini all ending in proglacial lakes, of the Qooqup (Qoorup) Sermia. 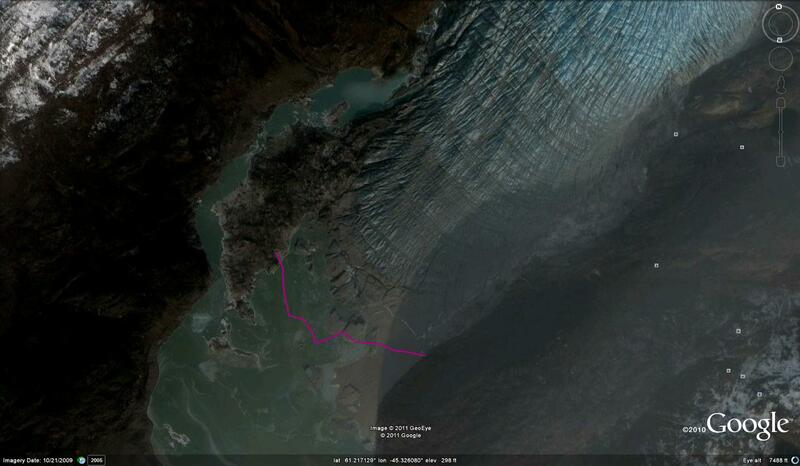 The latter glacier calves into a fjord. Kuussuup Sermia separates at 700 meters from Qooqqup and terminates at 100 meters. 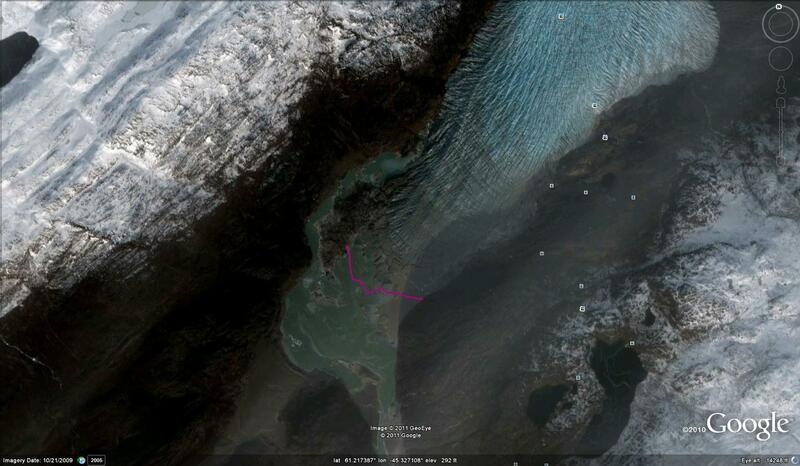 The glacier’s equilibrium line where accumulation equals snow melt approximately is visible both in a Landsat Image from the summer of 2010. This annotated image indicates the main proglacial lake terminus (green arrow), secondary lake termins (pink), Qooqqup calving termini (purple), where the two seaprate (yellow) and the snowline (orange). . The snowline is at 1800 meters in this Sept. 10 image, the typical snowline is at 1700 meters. There are a large number of nunataks in the area of the snowline. If the high summer melt rates of the last decade continue these nunataks should expand. The snowline here is higher than in southeast Alaska, for example on Taku Glacier snowline (1000 meters), Pelto (2011). 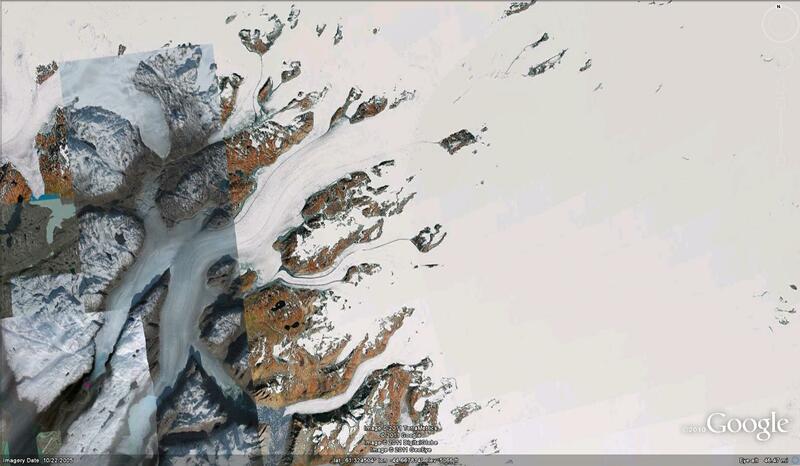 A comparison of the Landsat and Google Earth Imagery only span five years and show no significant changes. In Google Earth the terminus the green arrow area from the Landsat image is the focus, it is evident from 2005 (top) and 2009 (middle) during this period that the terminus has retreated 150 meters. 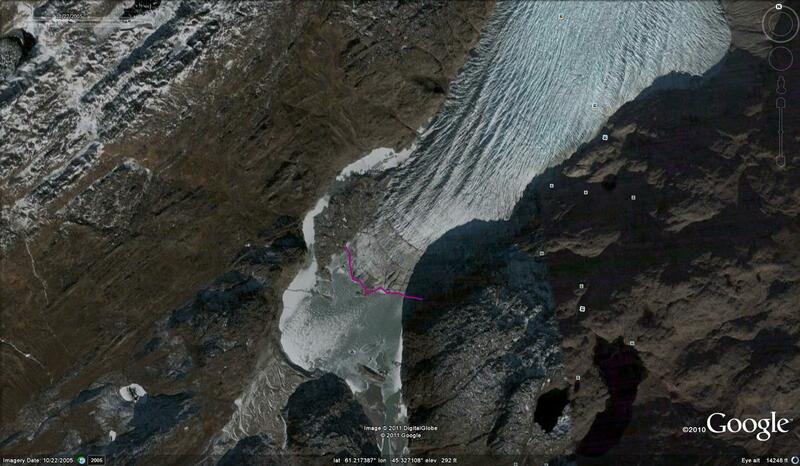 What is more apparent bottom is that the lower 100 meters of the glacier is shattered and will be quickly lost (bottom) . 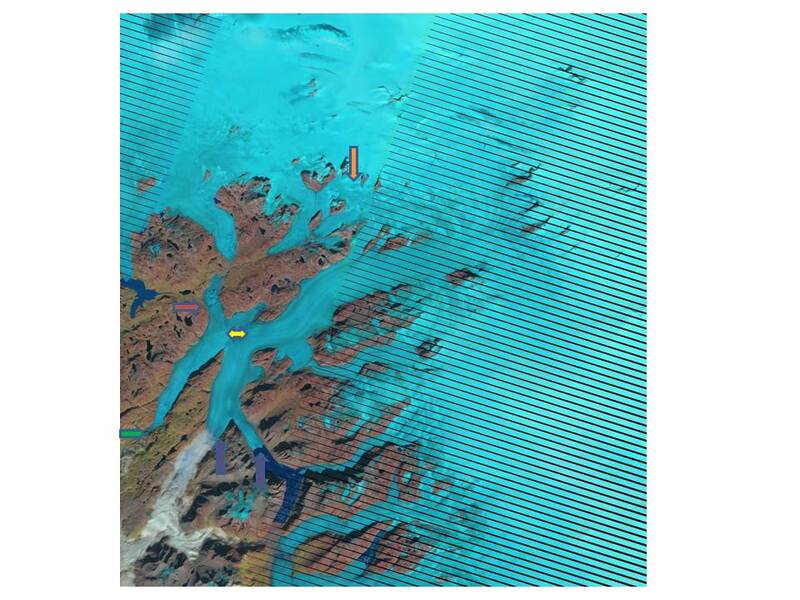 The snowline in southern Greenland was exceptionally high in 2007 and 2010, as noted by Mernild et al (2011) on Mittivakkat Glacier and by Tedesco et al (2011) and Box et al (2011) in terms of the temperatures and melting observed.